Next week I am taking a much needed few days to pray, read, and do sermon planning for 2014. For those of you who don’t know, I am a preacher that uses both the lectionary and sermon series at various times of the year. As all who are part of our worship team at FUMC Graham know – our worship planning comes to a screeching halt on December 31st of this year – so I have my work cut out for me. So … along those lines, I am looking for suggestions, ideas, topics, or themes that friends, members, visitors, or other random cyber strangers might throw into the mix as grist for the mill or water to prime the pump (let the metaphors begin). 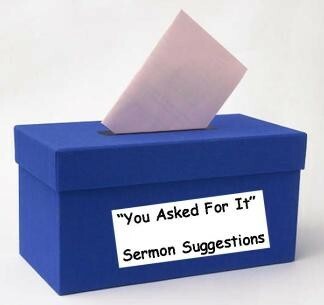 The online suggestion box is below – for FUMC Graham folk, you can also drop cards into an envelope on the bulletin board outside my study.